Home / Atlantis / BBC / Mythology / Reviews / TV / [Review] - Atlantis, Series 1 Episode 3, "A Boy Of No Consequence"
[Review] - Atlantis, Series 1 Episode 3, "A Boy Of No Consequence"
Third episode in, and the series takes a break from the myth plundering, for an episode more focused on characters and a touch of cultural archaeology. While it's a welcome change, without the glitz of some CG beastie, the faults of the program show through all the more. And while most of these are balanced by something done well, balance does not make for good television, it makes for passable television. And worst of all, the biggest fault is looking to be the hero himself. Hit the jump for the review, which contains spoilers that share a bond that transcends the physical. There was no great myth adaptation this week. In fact, this episode barely touched on anything mystical at all, save for a little out of area voodoo. The Oracle didn't appear, there was (thankfully) no talk of time travel, and it seemed like little more than a day in the historic life of a Bronze age Greek (or, Bronze age Cretan). What the episode did feature was bull leaping, so in place of a myth round up, I'll talk about that. Bull leaping was an activity the cities of Crete participated in, so some scholars believe. Since Crete and most other of the Aegean islands of the time worshipped bulls, in association with Poseidon, activities related to bulls were viewed as holy. Bull leaping is known from statues and frescoes dating to the Bronze age, though no evidence suggests that it was a punishment. In fact, despite how the episode framed it as a test of Poseidon's love, to do so would have been viewed as an affront to Poseidon. More likely it would have been akin to modern bull fighters, or acrobats. People trained in the art of the bull leap, and put on a show in veneration of their God, not in fear of it. This is, of course, supposition, as there are no accounts of bull leaping ever actually taking place. This episode filled in a lot of information about the secondary figures in Jason's world. We know, for instance, that Ariadne is not Pasiphaë's natural daughter, a sharp change from the mythical source material. Adaptation had already saved her from being the mother of the Minotaur, and now it seems that it has saved her from motherhood entirely. I suspect that in time we'll learn that, in great Greek tradition, Minos' first wife came to a tragic end at the hand of his foreign mistress. We also learned that the manipulative and power hungry Queen is a witch of some kind. Which God exactly she was preying to during her voodoo ritual wasn't made clear, though I wouldn't discount a misunderstanding of mythology to name it Hecate in future. Best I can tell, like Jason's many amalgamations, Pasiphaë has been merged (or rather, superseded) with the traditional depiction of her mythical sister Circe and cousin, Medea. Medea of course being the vengeful witch wife of Jason of the Argonauts. Her witch-doing is next another example of the God's hand at work, despite the shows instance thus far not to actually feature the Gods (which is a weird thing to be particular about, considering how important the role of Divine intervention is in myth). I think, at this point, it's painfully obvious that Jason is the son of Poseidon. His father's disappearance in a submarine, the Oracle's fear over the truth of Jason's parentage, and now his natural propensity for bull leaping all suggest that the patron God of Atlantis did done knocked up one of the locals. Which suggests a tantalising alternative to the time travel element in the pilot. What if it wasn't the future, but Olympus, the realm of the Gods? Mark Lewis Jones seems too recognisable an actor for the thirty second cameo in episode one, for him not to come back at one point. 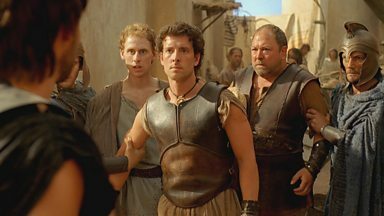 Mark Addy once again holds the episode up on his shoulders, and I would have no issue with this just becoming the Hercules show as it progresses. He's certainly more interesting and more engaging than Jason, and considering we know in what sort of esteem he'll eventually he held in, his presumed heroic journey is far more compelling. Best of all, his current depiction as a selfish drunken whore monger is a closer depiction of the mythical character than has ever been put to film. And good on the writers to run the romantic thread with Medusa through him rather than Jason. He's already got something dull brewing between stolen glances with Ariadne. Medusa herself continues to peak my interest, last week showing quick wit and compassion, this week showing bravery and cunning. These two characters alone could support the series. They certainly aren't getting any help from the rest of the regulars. Equally impressive this episode was Sarah Parish, brash and slippery. Heptarian isn't an adversary, he's a spoiled child, but Pasiphaë is a real threat. With her Medea-infused power wrangling, and inexplicable hatred of Jason (or, she's greatly overreacting to a simple crush), the series at least has a solid villain to make episodes difficult for the trio of friends, and Pythagoras. Traditionally, Pasiphaë is a daughter of Helios, and thus a demi-god herself. Whether this depiction has the same parentage or not, she seems desperate for someone easily manipulated to sit in Atlantis' throne, with her whispering just behind all the time. Jack Donnelly just isn't doing anything as Jason. He infused the role with no humanity, no emotion and little charm. And his shirtless bull leaping here just seemed so very Original Series Kirk to be taken seriously. That, and the CG used in the leaping scenes was reminiscent of the 1960's, in that it was terrible. Not so bad as Alexander Siddig's performance as Minos. Either he was drunk or really doesn't care. The undercurrent of tired, repressed monarch I picked up on in the pilot episode is gone, replaced with an oddly paced string of dialogue recitation that you might expect from a newcomer, not a seasoned pro like Siddig. It didn't help the tension of the episode that the entire situation the heroes (and Pythagoras) were put in was completely lacking in any drama at all. Straight away, the leaping instructor says if anyone in their team dies, they all die. And with three of the staple cast members on the team, there is less than zero chance of the team failing. If only Hercules had been made to leap, there might have at last been a twinge of intrigue as to how it all might end. I applaud Overman's decision to move away from the mythic stuff for an episode, that needs to happen more regularly. Character development and back story are important to establish. But the story could have held together better, as it did last week. And while he has no control over this himself, the acting needs to improve. Colin Morgan and Bradley James weren't the best when Merlin began, but they improved over time, so I'm going to cut Donnelly a bit of slack. but it's his job to pick it up from here on out. And someone needs to sober up Dr. Bashir, before he embarrasses himself again.